Today we are fortunate to have a guest contribution written by Jon Frost and Ayako Saiki, econonomists at the De Nederlandsche Bank. The views expressed here are those of the authors and do not necessarily reflect the position of De Nederlandsche Bank. Common wisdom often suggests that financial openness makes a country more vulnerable to a balance of payment crisis, as it allows foreign capital – which tends to be much more volatile than domestic financing – to destabilize the balance of payments. Yet the results of our recent paper (Frost and Saiki, 2013) suggests the opposite: capital account openness is associated with a lower chance of currency crises, perhaps because it fosters stronger institutional development. While surges in capital flows, especially in the form of short-term debt flows, make a country more vulnerable to a currency crisis, financial openness as measured by the Chinn-Ito index is associated with a structurally lower vulnerability, particularly for advanced economies. This result highlights the role of financial openness in safeguarding a country from a currency crisis. The devastating and long-lasting economic impact of currency crises is well-documented (see Frankel, 2005 for example). The recent currency crises in Iceland (2006 and 2008) and Australia (2008) demonstrate that currency crises are a no longer unique phenomenon of emerging economies with fixed exchange rates. In some cases – e.g. Malaysia in 1998, Iceland in 2008, or India in 2013 – countries respond to such crashes by instituting capital controls on outflows (In Malaysia and Iceland, capital controls targeted the domestic investments of foreigners, while recently tightened restrictions in India apply to foreign investments of domestic residents.). Other countries – like Brazil in 2010 – institute controls on inflows as a means of taming risky foreign capital and preventing excessive appreciation. Yet most countries around the world have loosened capital controls over the past decades, generally in tranquil times. There is some empirical evidence that this has been associated with better growth outcomes (Quinn and Toyoda, 2008). The benefits seems to accrue primarily through indirect effects on institutional development (Kose, Prasad, Rogoff and Wei, 2009) and are stronger if certain thresholds of development are already reached (Kose, Prasad and Taylor, 2011). The IMF’s recently adopted institutional view on the liberalization and management of capital flows includes the notion that countries with greater financial and institutional development will be able to benefit more from liberalization, but capital controls can be justified under certain circumstances. Against this backdrop, our recent study develops an early warning model for currency crises with explicit consideration for financial openness. We measure financial openness using the well-known Chinn-Ito Index, a de jure measure of openness based on the IMF’s Annual Report on Exchange Arrangements and Exchange Restrictions (AREAER) which is available for 181 countries for the period 1970-2011. Aside from the Chinn-Ito index, we look at various macroeconomic variables that turned out to be significant in past studies (summarized in the meta-study of Frankel and Saravelos, 2011); for example, real effective exchange rate appreciation, reserve coverage, inflation and GDP growth. Our second contribution to the literature is that we looked at surges in gross (instead of net) capital flows. We look both at the period 1975-2007 (in sample) and 2008-2011 (out of sample testing). Overall, we find a significant negative effect of openness on crisis probability, indicating that a country with a more open capital account is less likely to experience a currency crisis, ceteris paribus. This effect has high statistical significance for advanced economies. Yet it is much weaker for emerging market economies, which generally have lower levels of financial and institutional development. Moreover, surges in gross capital flows are associated with a higher probability of crisis, particularly when these are in the form of short-term debt flows (portfolio and bank lending). In terms of economic significance, however, the structural effect of openness is generally stronger than the cyclical effect of capital flows. In other words, countries with open financial markets are generally better placed to mitigate or prevent a currency crisis. Moreover, the result appears robust to how one measures capital account openness. In addition to the Chinn-Ito index, we use Quinn’s de jure measure, two de facto measures of trade and financial openness, and a hybrid measure. These are also all negatively associated with crisis vulnerability – with the de jure and hybrid measures statistically significant yet having less strong effects for EMEs. As an out-of-sample test, we draw the receiver operating characteristics (ROC) curve below, which plots the rate of crises correctly called by our model (true positive rate) against the rate of non-crises correctly identified as such (true negative rate) at various thresholds of fitted values for crises out of sample. 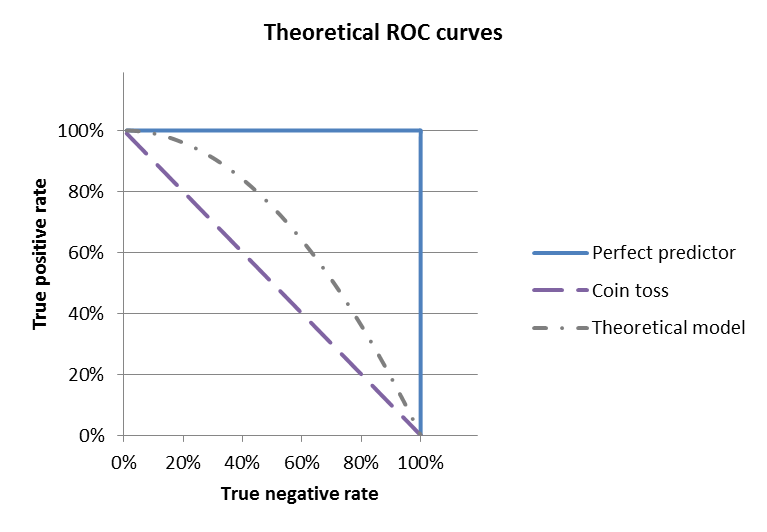 The left panel describes the idea of the ROC curve. A perfect predictor (blue line) would consistently call all crises and non-crises correctly, while a coin toss (dotted purple line) would provide no useful information at any threshold (left panel). 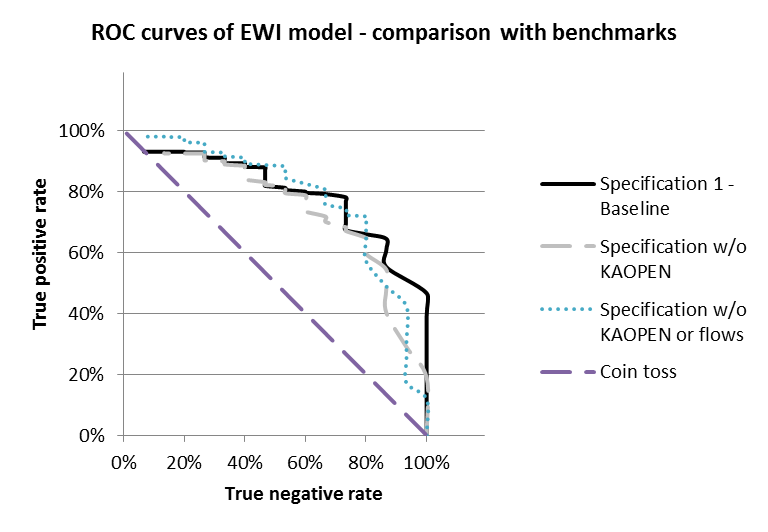 The graph at the right panel indicates that our model predicts the crises substantially better than a coin toss. Moreover, at all thresholds relevant for policy use, the baseline with financial openness and capital flows (black line) outperforms similar models without these variables (blue and gray lines), indicating the usefulness of taking financial openness into account when predicting a currency crisis. For country authorities trying to make their financial markets more robust to currency crashes, the results suggest that liberalization of the capital account, if done correctly, will bring better long-run outcomes. This is particularly relevant for countries which are relatively more advanced in terms of institutional and financial development. For less developed countries, there may be a stronger case for capital restrictions until institutional capacity is strong enough for open financial markets. For all countries, monitoring gross capital flows is vital. Yet if the right policy conditions, such as stable macroeconomic policy and prudent financial regulation, are in place, then financial openness can successfully help keep costly currency crises at bay. This post written by Jon Frost and Ayako Saiki. This entry was posted on January 8, 2014 by Menzie Chinn. This post didn’t seem to draw any comments, but I thought it a solid piece of work and a meaningful contribution to the body of knowledge on the topic. Also, for Menzie, kudos on the Chinn-Ito index. It seems to me that this is going to become one of the standard measures in use, something which I personally consider an accomplishment.